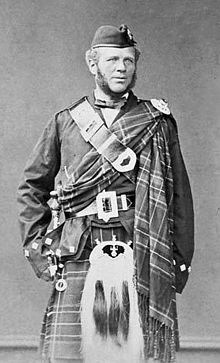 John Brown (8 December 1826 – 27 March 1883) was a Scottish personal attendant and favourite of Queen Victoria for many years. He was appreciated by many (including the Queen) for his competence and companionship, and resented by others for his influence and informal manner. The exact nature of his relationship with Victoria was the subject of great speculation by contemporaries and continues to be controversial today. 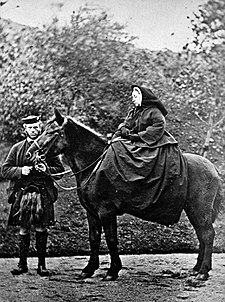 Brown was born on 8 December 1826 at Crathienaird, Crathie and Braemar Aberdeenshire, to Margaret Leys and John Brown, and went to work as an outdoor servant (in Scots ghillie or gillie) at Balmoral Castle, which Queen Victoria and Prince Albert leased in February 1848, and purchased outright in November 1851. Brown had several younger brothers and a sister, three of whom also entered the royal service. His brother Archibald Anderson "Archie" Brown, 15 years John's junior, eventually became personal valet to Victoria's youngest son, Prince Leopold, Duke of Albany. Prince Albert's untimely death in 1861 was a shock from which Queen Victoria never fully recovered. John Brown became a good friend and supported the Queen. Victoria gave him gifts and created two medals for him, the Faithful Servant Medal and the Devoted Service Medal. She also commissioned a portrait of him. Victoria's children and ministers resented the high regard she had for Brown, and inevitably, stories circulated that there was something improper in their relationship. The Queen's daughters joked that Brown was "Mama's lover", while Edward Stanley, 15th Earl of Derby, wrote in his diary that Brown and Victoria slept in adjoining rooms "contrary to etiquette and even decency". Victoria herself dismissed the chatter as "ill-natured gossip in the higher classes". The diaries of Lewis Harcourt contain a report that one of the Queen's chaplains, Rev. Norman Macleod, made a deathbed confession repenting his action in presiding over Queen Victoria's marriage to John Brown. Debate continues over this report. It should be emphasised that Harcourt did not receive the confession directly (he was nine when Macleod died) but that it passed (if it did) from Macleod's sister to the wife of Henry Ponsonby, the Queen's private secretary, and thence to Harcourt's father Sir William Harcourt, then Home Secretary. Harcourt served as Home Secretary in the final three years of Brown's life. While it is true that some widowed monarchs have contracted private marriages with their servants, there is little evidence that Victoria married Brown. "Perhaps never in history was there so strong and true an attachment, so warm and loving a friendship between the sovereign and servant ... Strength of character as well as power of frame – the most fearless uprightness, kindness, sense of justice, honesty, independence and unselfishness combined with a tender, warm heart ... made him one of the most remarkable men. The Queen feels that life for the second time is become most trying and sad to bear deprived of all she so needs ... the blow has fallen too heavily not to be very heavily felt..."
The phrase "life for the second time" relates to the death of her husband Prince Albert. The historian who discovered the letter believed that it suggested that Victoria, in her mind, equated Brown's death with Albert's, and that she therefore viewed him as more than a servant. Whether Brown and Victoria were actual lovers, however, is not known. "This stone is erected in affectionate and grateful remembrance of John Brown the devoted and faithful personal attendant and beloved friend of Queen Victoria in whose service he had been for 34 years. Born at Crathienaird 8th Decr. 1826 died at Windsor Castle 27th March 1883. That Friend on whose fidelity you count/that Friend given to you by circumstances/over which you have no control/was God’s own gift. Well done good and faithful servant/Thou hast been faithful over a few things,/I will make thee ruler over many things/Enter through into the joy of the Lord." Those who believe that the Queen saw Brown as little more than a servant point to the fact that after his death she became similarly attached to an Indian servant, Abdul Karim, one of two who had come to work for her in late June 1887. She called him the Munshi, and he came to be resented even more than John Brown: unlike Brown, whose loyalty was without question, there was evidence that Karim exploited his position for personal gain and prestige. Tony Rennell's book Last Days of Glory: The Death of Queen Victoria reveals that Victoria had entrusted detailed instructions about her burial to her doctor, Sir James Reid (Brown died in 1883: the Queen's wish was for him to attend to her). These included a list of the keepsakes and mementoes, photographs and trinkets to be placed in the coffin with her: along with Albert's dressing gown and a plaster cast of his hand, the Queen was buried with a lock of Brown's hair, his photograph, Brown's mother's wedding ring, given to her by Brown, along with several of his letters. The photograph, wrapped in white tissue paper, was placed in her left hand, with flowers arranged to hide it from view. She wore the ring on the third finger of her right hand. The statues and private memorials that Victoria had created for Brown were destroyed at the order of her son, Edward VII, with whom Brown had often clashed and who resented Brown for his influence. He had no thought but for me, my welfare, my comfort, my safety, my happiness. Courageous, unselfish, totally disinterested, discreet to the highest degree, speaking the truth fearlessly and telling me what he thought and considered to be "just and right," without flattery and without saying what would be pleasing if he did not think it right. . . . The comfort of my daily life is gone--the void is terrible--the loss is irreperable! Design and manufacture of both medals were commissioned by Queen Victoria. The 1997 film Mrs Brown is the fictionalised story of John Brown. Sir Billy Connolly stars as Brown and Dame Judi Dench as Victoria. The 1950 film The Mudlark features John Brown at Windsor Castle, portrayed by Finlay Currie. ^ Scotland, Royal Deeside. "John Brown, faithful servant to Queen Victoria". Royal Deeside, Scotland. ^ Baird, Julia (29 August 2014). "A Queen's Forbidden Love". The New York Times. ^ a b Thornton, Michael (25 February 2012). "Victoria's secret? New evidence shows Queen Victoria married her Scottish groom and bore him a secret daughter who was spirited to America". London: Mail Online. ^ Duff, David (1968). Victoria in the Highlands. London: Frederick Muller. p. 199. ^ Bates, Stephen (16 December 2004). "Letter from Queen Victoria points to affair with Brown". The Guardian. London. Retrieved 6 May 2010. ^ "John Brown". Find A Grave. Retrieved 24 July 2017. ^ Lamont-Brown, Raymond (2003). "Queen Victoria's 'secret marriage'". Contemporary Review. Archived from the original on 12 March 2007. ^ McLean, Charles. Balmoral Highland Estate. Balmoral Castle and Estate. ^ Baird, Julia (2016). Victoria The Queen: An Intimate Biography of the Woman Who Ruled an Empire. New York: Random House. p. 404. ISBN 9781400069880. ^ Baird, Julia (2016). Victoria the Queen: An Intimate Biography of a Woman. New York: Random House. p. 406. ISBN 9781400069880. Wikimedia Commons has media related to John Brown (servant).